"“Court preparations and costs associated can be overwhelming and daunting. Mr. Brown was able to get to the heart of my case and put me at ease. My stress was relieved after discovering Brown and Gould’s professionalism and history of excellence. They did prove to be very organized and successful. Thanks to this firm, I was prepared, knowing what to do before, during and after the court case. I highly recommend choosing this well established firm, it will be worth the investment.”"
"Top of the line legal representation: I recommend George Brown. We highly recommend Mr. Brown for your legal services. He is different in the fact that he cares for people providing secure and professional assistance as an attorney. We feel very fortunate to have had his legal assistance in resolving our case at a very difficult time. Two thumbs up on a great job by him and his colleges. We cannot thank him enough for his friendship and knowledge as an attorney of law." "Construction Dispute: I recommend George Brown. George Brown helped us with a customer that was not paying his construction bills. George was very articulate and professional with his legal services. He did not leave any stone uncovered. There were several instances that there was a need for him to respond within a day; he and his legal assistant were always available in that time frame. We have been extremely impressed with the timeliness and professionalism by George and his staff members. We would definitely recommend him!" "I recommend George Brown. 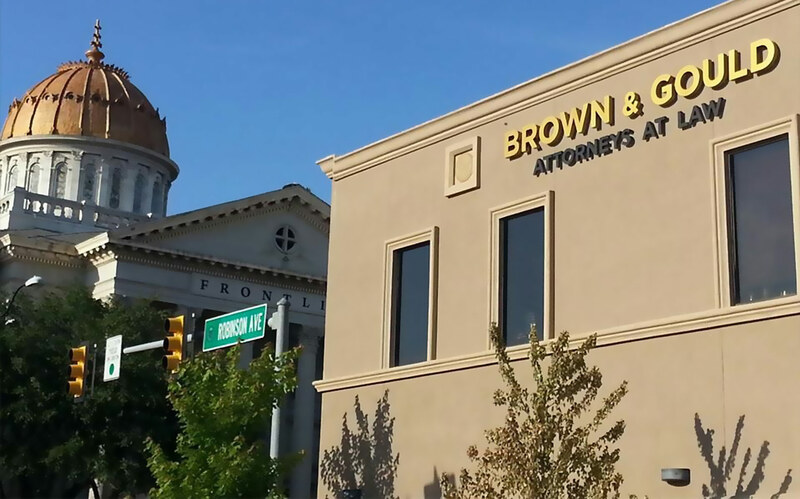 Mr Brown was referred to us by a very large law firm in Oklahoma City who felt that he could provide both a more personal experience and a more qualified response to our particular case matter. We found Mr Brown to be the perfect balance between professional and personal. He and his team always responded quickly and kept us informed in a manner we felt very comfortable with. In one specific matter which involved a complicated case involving our daycare and the Department of Human Services, Mr. Brown represented us extremely well. He defended our position, negotiated on our behalf and enabled us to reach an agreement that we were extremely satisfied with. In relation to our church, Mr Brown has provided us excellent counsel in handling employment disagreement, including preserving our right to own and control product produced by our employees during their employment with our church. Intellectual property and creative elements have been fully protected by the church through this process. We continue to retain his services for any matters that come before our church or daycare and have recommended him to many others. " "I recommend George Brown. I have had George represent me two times, Once in a divorce and once in a civil matter. The divorce case was settled in as terms as a divorce can be. I was very happy with the results. The civil case was settled out of court, I think in part because of George's preparedness. Again I was very happy with the results. George is very good at answering the phone calls and returning phone calls, Communication is very good. I would highly recommend his firm." "I recommend George Brown. My son contacted Brown and Gould. At the time, he didn’t have much faith in the legal system after having a bad experience with a previous attorney. After speaking to George Brown he hired him. Mr. Brown was very professional and understanding. He made my son feel safe and brought back his faith in the legal system and for the first time in a long time, my son had hope. The staff at Brown and Gould are very professional and a joy to work with. Mr. Brown made our whole family feel like Family . Every time my son needed to speak to Mr. Brown his calls or emails were returned the same day which makes you feel at ease. When the big court date came Mr. Brown represented my son fully. In fact, my son knew everything would be okay because Mr. Brown was in his corner 100%. Brown & Gould is the best . We can not say Thank You enough. If you’re looking for an awesome law firm that is 100% there for you at all times and are amazing people and do 100% what they are hired to do then Brown and Gould Law Firm is who you need. Mr. Brown was sent to us from the Good Lord above . Thank you again Brown and Gould for making us feel like family and for fighting for my son 100 %. George, we will forever be grateful to you and to Tina, Thank You again." "The Man You Call First If Your Wise, Second to Dig You out of Your Own Hole I recommend George Brown. Simply put, I had bad counsel and didn't know it until I had that little bad feeling late in the game. I asked through inside connections for a juggernaut and a person with a reputation of being able to get things done. My lawyer friend recommended George. True to the recommendation, George brought it when I was more down than I realized. I can't recommend George and his staff more. He saved me more than I can imagine, when I needed just short of a miracle and didn't see it coming yet. At the end of the day, George was truthful and wise when I needed the advice and delivered like a sledgehammer when I needed it the most. To his credit, he could have made much more money on my case, but he advised me fairly of my risk and let me decide what risk was worth it. My hat is off, my legal counsel for life should I ever have the need again. " "BROWN & GOULD took care of my business quickly and professionally. I didn't have to wonder what was going on because they kept me well informed. They were easy to work with and answered any and all questions I had with patience and clarity. I have already recommended them to a friend and would be happy to do so again. Semper Fi." "David and I are very satisfied with the BROWN & GOULD team. We would highly recommend their services. Oklahoma City, OK"
"I have been a client of Brown & Gould for approximately seven years. They have served me and my family during a long and difficult divorce and child custody case. George Brown has been a faithful, patient lawyer who answers litigation swiftly and wisely. He has always been there for us in time of need. I would highly recommend Brown & Gould and staff for any legal needs you may encounter. " "For several years I wrote letters of complaint against my insurance company but to no avail. I called Attorney Gould and within 6 months I received a settlement. God still works miracles for those who believe. Attorney Gould is smart and fast in resolving problems. 'Don't try fighting the Bureaucrats, hire someone who speaks their language you'll be glad you did.'" "I would recommend the excellent law firm of BROWN & GOULD, to anyone who needs help with their legal problems. My problem had reached the point that I needed good legal help. I feel like Tony Gould so gently guided me through the whole process. Tony made it easy for me in that he drove 120 miles to my home to direct and encourage me during my five hour deposition. Tony kept me posted on the progress of my case. He properly handled the mediation meeting. Tony handled all things in a professional manner. Therefore I highly recommend the BROWN & GOULD attorneys & counselors at law to anyone who needs their services. " "George Brown, with Brown & Gould Law Firm, is an excellent attorney. I have dealt with many attorneys in the last 25 years of my practice, and he is above all the most ethical, professional, caring and honest attorney I have ever dealt with regarding legal work for not only my business but also regarding personal matters. He goes above and beyond in every way and is willing to listen to you, and he not only cares about you, but also gets you the desired result that you are in need of. I would highly recommend Mr. George Brown to represent you for any legal matter that you would have. Sincerely,"
"Your work has greatly improved our life and reduced the stress we were both suffering from. It is certainly easier to feel better, when the weight of medical bills is lifted. As we enter the new year, I wish you continued success in everything you tackle. With sincere appreciation,"
"Several years ago, I began an exhaustive search for a new law firm to represent my family in various legal matters. We hired George Brown with Brown & Gould, PLLC, B&G, and now highly recommend his law firm, without reservation, as a results oriented law firm. The attorneys at B&G have provided us consistent sound legal advice while remaining sensitive to our hardships and legal liabilities. B&G brings a wealth of experience to each case by drawing on each Attorney's education and experiences while optimizing favorable results for their clients. We have collected hundreds of thousands of dollars as a result of the legal services provided by B&G and trust them with our most sensitive matters. B&G provides personalized attention to its clients and welcomes initial consultations. Instead of an ambulance chaser mentality, B&G clients are provided legal strategies that are best suited for the client and that may not result in the most legal fees being collected by B&G. B&G's demonstrated success at winning complex commercial litigation cases and proven track record representing individuals and families has postured them as a preeminent law firm in the state of Oklahoma. Sincerely,"
"It is unfortunate, but these days most Americans cannot live their lives without, at some point, being abused (by companies or individuals) at a level that c.alls for legal protection. It is also an unfortunate reality that those of us who have been abused will not have an attorney "on retainer" to protect us from this abuse. Fortunately there are Trial Attorneys who understand what we are facing and who understand how to resolve the problems we have faced in a realistic and viable manner. As an "Average American" (and Veteran) I was stunned to find my wife and I in the middle of a medical expense problem, with significant financial losses closing in on us; all because of abusive insurance companies who simply refused to properly pay claims. We were fortunate, however, in that we were introduced to Tony Gould of Brown & Gould. Tony took the time to discuss our situation with us, to advise of the actions we could, and should, take. He worked out a plan to help us in a manner that we could afford. And most important of all, Tony and his associates put in the hard work to be successful in solving our problems. Because of their efforts we "Won". There is no guarantee that everyone who has been taken advantage of can "Win", but there is a way that we can fight the battles that we face with Attorneys like Tony Gould. " "To All, I have had the unfortunate experience to need to hire not just one attorney, but multiple attorneys. Many talk the talk but do not walk the walk. George Brown does both and does such with the tenacity needed in today's litigation prone society. He is knowledgeable, experienced, and leaves no stone unturned. He listens to your concerns and provides the necessary guidance to get the job done. I have wasted countless dollars on unnecessary actions and undeserving attorneys. George Brown and his team earn their fees and do not waste your money. All attorneys should be as responsible and prepared as Mr. Brown and his team. George Brown is a shining star. "